This page covers the author of The Chronicles of Thomas Covenant the Unbeliever. For other authors named Stephen Donaldson, see the disambiguation page. Stephen Donaldson (1) has been aliased into Stephen R. Donaldson. 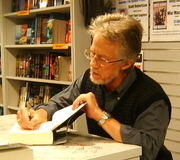 Works have been aliased into Stephen R. Donaldson. "Stephen Donaldson" is composed of at least 2 distinct authors, divided by their works. You can edit the division. Stephen Donaldson is composed of 1 name.